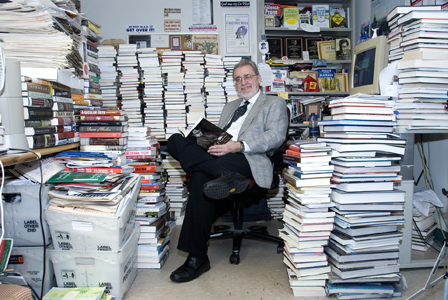 Frank Wilson will be hanging up his hat as books editor of the Philly Inquirer on Friday and I feel that the battle to save book reviewing sections has been lost. I figured that if Frank could keep his books section running, the newspaper situation would be okay. I know that there were many struggles to keep the section afloat and that Frank worked damn hard at his job, often performing double duty on other arts sections. But he won’t tell you about what he went through. Because he’s always been a class act. He cared a good deal about arts coverage and he had many ideas on how to make a books section both lively and profitable. He was a man who fought hard to get a Steve Erickson review running off the front of the Arts & Entertainment section. But I suspect many of his innovative ideas fell on deaf ears. I don’t know if Frank will ever reveal the true sacrifice of his labors. But trust me. The man did everything he could and kept at this game far longer than any reasonable person should. So the news depresses me. Because Philadelphia was lucky to have Frank Wilson. Hell, the whole nation was lucky to have Frank Wilson. He was possibly too smart for this business. He may have cared too much. Frank ran reviews on all types of books from all types of writers. One turned to the Inquirer‘s books section for passionate and thoughtful books coverage, not a section composed of “names” coasting by on credentials. Unlike many other editors, he was open-minded enough to understand that the current convergence between print and online was not a development where you had to pick a side, but where you had to work both sides of the fence and bring people together. He corralled top talent in the blogosphere and forced them to up their game. He knew intuitively where cultural coverage was going and did everything he could to bridge the gap. He was also the first newspaper editor to take a chance on me with a book reviewing assignment. And so I owe much of my current full-time freelancing career to Frank. And I will never forget him for this. I was extremely privileged and honored to write for him. And I always busted my hump to get him something extra special. He let me get away with reviews written in the first person plural and let me throw in a lot of embedded wordplay that I sneaked into my reviews to amuse the copy desk. In return, I’d try to scout out books for him that nobody else was covering. But now that Frank’s almost gone, with his Books, Inq. blog sadly following, this is a huge loss for Philadelphia and a huge loss for newspapers. The news came hot on the heels of other losses in the Philadelphia newspaper community. So it stings that much more. I’m not sure if this means the end of the Inquirer‘s books section. But the paper needed Frank Wilson. And I don’t think they were really aware of the talent they had.